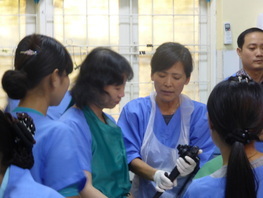 A member based association of over 100 volunteer Australian and New Zealand medical professionals and others, ANZGITA, working with local partners, is regularly delivering gastroenterology and endoscopy training programs to doctors and nurses in AsiaPacific with the support of industry, professional groups, donors, governments and others. We welcome your support and involvement. LATEST NEWS: ​New Endoscopy Unit at the National Referral Hospital, Honiara, Solomon Islands, opened during the recent training program. Annual training programs are run in Fiji and Myanmar in accredited WGO training centres and in Solomon Islands and Timor-Leste. Over 100 doctors and more than 90 nurses in the Pacific region alone have participated as trainees. Opportunities exist to broaden our services and train in more locations. We have valuable partners in the areas of training delivery, funding, equipment, accessories and materials, and logistics. The gastroenterology and broader medical fraternity along with governments have lent us their support. Donations in support of our work are always welcome. Our members are people and organisations who support the attainment of our shared objectives. Trainers are the doctors and nurses who supply their time pro bono on our programs. Read what one feels about his involvement. Together they are the heart and soul of our association. Join us!